Today we are joining organisations around the world to celebrate the second World Digital Preservation Day (first launched as International Digital Preservation Day in 2017). The day aims to raise awareness of digital preservation and the work taking place to ensure collections remain accessible over time. All of our digital objects – in any format – are at risk of obsolescence, corruption or destruction. They need to be actively managed, so that they remain accessible. Storage alone is not a solution to digital preservation. It is instead a combination of people, processes, and technologies which together provide the means to capture, preserve and provide access to the digital objects found in our collections. Our archives and special collections include material relating to film, performance, design, books arts, fashion, textiles, sound arts, the history of the institution, and the emerging digital arts landscape. These are increasingly hybrid in nature – containing both physical alongside more and more digital materials, created through digitisation, or born digital. During 2018, in the first phase of the Digital Archives & Collections Project, we have been establishing the infrastructure and processes for managing and preserving our growing digital collections. We introduced the project in a blog post earlier this year and we are now able to provide an update, to coincide with World Digital Preservation Day. Home to more than 20TB of digital archives and special collections materials, we are focusing on an agreed list of priority collections. These represent various types of media and include materials from collections across the six different colleges. They have been identified as a priority for preservation, improved access, or a combination of the two. Those flagged as being prioritised primarily for preservation are those which are considered most vulnerable. This may refer to concerns around current storage, for example digital materials held on an external hard drives, or the age of the digital material. Or indeed its prioritisation may be based on its uniqueness, for example our digitised materials could be digitised again if needed, whilst we will likely be unable to replace born digital materials if lost. In recent months we have been preparing collections for upload into our new digital preservation system. This has included an amount of ‘digital housekeeping’, where we are ensuring that file names and structures are meaningful and will aid their discovery. In a milestone for the Project, following testing during the summer months, we recently uploaded our first collections to our digital preservation system. These includes a number of estates plans digitised between 2016 and 2017. 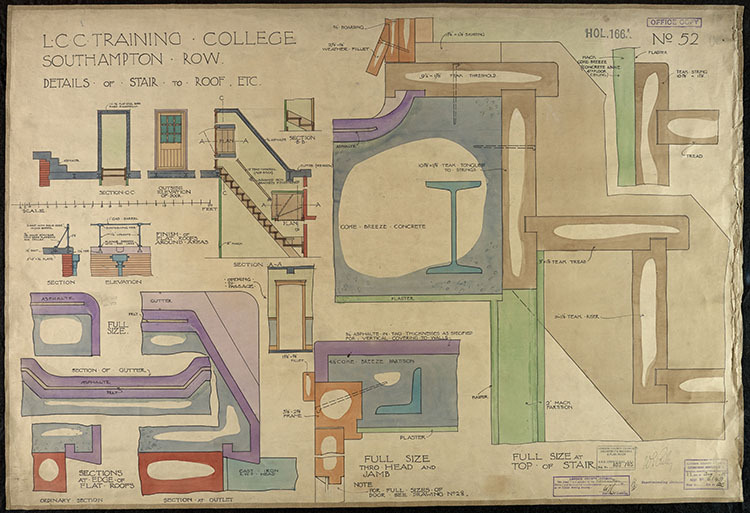 These plans, which date from 1935-19890, chart the changing landscape of the University & its constituent Colleges, including plans of buildings which are no longer part of UAL. One of the primary objectives of this project is to make digital collections available for teaching, learning and research, in a way which meets the expectations of our art and design community. In the second phase of the project we have begun exploring the development of a new online portal for our digital archives and collections.